The Post Office has named 24 branches it plans to close in Dorset as part of nationwide proposals to close 2,500 branches by the end of the year. Four further branches will be replaced by "outreach" services. Ministers say cuts are needed because the network has been losing £4m a week. The Post Office said 162 other branches would remain open across the county. A six-week public consultation has begun until 1 September, before a final decision is made. The government announced the nationwide wave of 2,500 closures in December 2006 following a 12-week national consultation. It said four million fewer people were using the current 14,000-strong network each week than two years earlier. Branches under threat in Dorset include Buxton Road in Weymouth, the Ministry of Defence's Blandford Camp site, Sandbanks, Worth Matravers, Kittwhistle near Beaminster and West Bay. Tim Nickolls, the Post Office's network development manager for Dorset, said: "Taking the decision to close any Post Office branch is always very difficult and we know will cause concern to many of our customers. "We want to ensure that everyone who uses, relies on or has any concern with Post Office services is both fully aware of the proposed changes, and able to give views on them." The outreach services proposed for Buckhorn Weston, Buckland Newton, Chettle and Kings Stag could include a mobile service visiting at set times, the Post Office said in a statement. Or it could include "a hosted service operated within third party premises for restricted hours each week, or a partner service within the premises of a local partner (such as a pub landlord)". 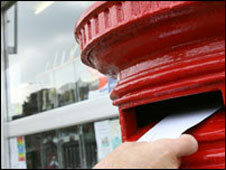 It added an independent "access assessment" of each post office in Dorset had been carried out. These have been published on the Nationwide Access Register - a source of information for people with disabilities, the elderly and people with pushchairs - on the Direct Enquiries website. The first wave of proposed branch closures were announced in October 2007 in Kent, East Midlands, the East Yorkshire area and North Lincolnshire. In the 1960s, there were 25,000 post offices but these began to close in 1970 and the last decade saw 6,000 shut.